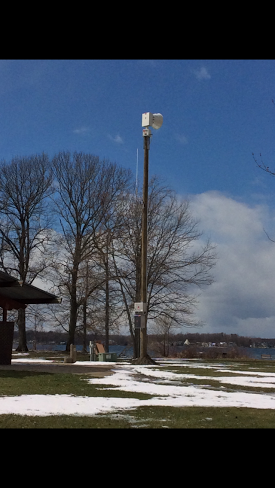 Here’s a beautiful sight (photo courtesy of Gun Lake resident Jack Pearson) – the brand new Weather Siren located at the Yankee Springs State Park Picnic Area (the geographical center of the lake). Its purchase was a partnership project between the Gun Lake Protective Association, Tribal Chairman D. K. Sprague and the Gun Lake Tribe; and Yankee Springs, Orangeville, Martin, and Wayland Townships! The MiDNR and Yankee Springs State Park provided the land, permitting process, and electric; and it is activated by the Orangeville Township Fire Department. The GLPA will cover the yearly maintenance. It’s a beautiful testimony to cooperation between governments and organizations, to keep us safe. It will be tested on the first Saturday of each month, and will be activated for tornadoes, (or possibly for extreme straight-line winds). The normal distance one can hear one of these sirens is a mile radius; but because it faces open water, the sound might carry quite a bit farther. I had roughly calculated that on a hot summer weekend, there could be as many as 8,000 people within the radius of this siren! This entry was posted in Current News, Warning Siren. Bookmark the permalink.